Apple has been loading up on video game-related patents recently, but so far all of its controller copyrights have made the ideas seem like single-player affairs. This week, however, it was revealed that the Cupertino company was granted a multiplayer gaming patent along with 42 other successful patents filed with the U.S. Patent and Trademark Office. 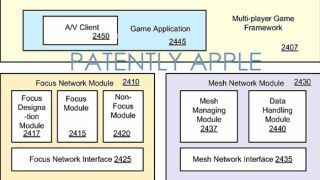 While the application doesn't spell out a long-rumored Apple game console, it does lay out different types of networks that could relay gaming media content. "Apple's focus zeros in on delivering a very high-end video gaming experience specifically for multiplayer gamers," noted Patently Apple, which rifled through the patent application today. "[Gamers] will be able to use chat, video and other forms of communication while gaming with their buddies," noted Patently Apple, which rifled through the patent." In addition to setting up a process for joining and inviting other players to multiplayer games, the patent details how gamers would be able to initiate in-game audio chat sessions. This could extend between both desktop computer and mobile devices, demonstrating that this multiplayer gaming patent may cover everything from Macs to iPhones to newer technologies. Whether or not the in-game chat capabilities outlined in this patent are intended to include video, along the lines of FaceTime, remains to be seen. This newly published Apple multiplayer patent gives credence to the theory that the company is turning to gaming when exploring, as Tim Cook said, "exciting new product categories." Besides patenting multiple game controllers, the Apple was reportedly talking to developers about launching a proprietary game controller at GDC 2013. The impact of an dedicated Apple gaming machine could destroy console gaming, according to a former Microsoft lead engineer and Xbox co-founder Nat Brown. Agreeing with this former video game industry head, 50 percent of Brits polled said they would put money down on an Apple game console. With analysts sour on the prospects of the new Xbox and PS4 matching current generation-console sales, Apple's gaming competition in the future may actually be Google, which is also patenting multiplayer services in a hurry.